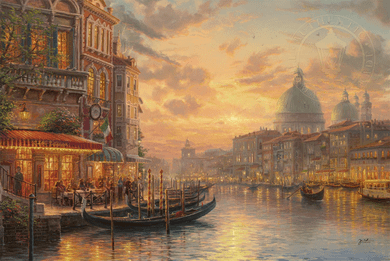 Thomas Kinkade Limited Edition Giclee on Paper and Canvas:"Venetian Café"
About the Art: If there was ever a place to fall in love, it would be here. Any visitor arriving in Venice is immediately transported into another world, one whose atmosphere and beauty remain incomparable. Once a major maritime republic, now this island city draws artists, romantics, and architectural enthusiasts. At every turn of the canal, you will find the sidewalks lined with a luminous spectacle of ornate marbled and frescoed palaces, bell towers, and domes alongside various shops and cafés that cater to visitors from across the world. Picture yourself at Café Venezia, a must stop for any traveler, offering fine Italian cuisine for the body and stunning views of Saint Mark's Basilica at sunset for the soul. An empty gondola waits for you, a trip to Venice wouldn't be complete without a cruise down what is arguably the most beautiful street in the world, the Grand Canal. In the distance, you can view Saint Mark's Basilica. It is one of the most valuable treasures of history, art, and faith in the world. The three birds flying in-between the sunset and one of the domes of Saint Marks's Basilica is a tribute to Thomas Kinkade. This is the second piece in the Romanic Moments series following Italian Café.